Maya Angelou. Source: Wake Forest University News Center. Today, Michelle and I join millions around the world in remembering one of the brightest lights of our time – a brilliant writer, a fierce friend, and a truly phenomenal woman. Over the course of her remarkable life, Maya was many things – an author, poet, civil rights activist, playwright, actress, director, composer, singer and dancer. But above all, she was a storyteller – and her greatest stories were true. A childhood of suffering and abuse actually drove her to stop speaking – but the voice she found helped generations of Americans find their rainbow amidst the clouds, and inspired the rest of us to be our best selves. In fact, she inspired my own mother to name my sister Maya. Like so many others, Michelle and I will always cherish the time we were privileged to spend with Maya. With a kind word and a strong embrace, she had the ability to remind us that we are all God’s children; that we all have something to offer. And while Maya’s day may be done, we take comfort in knowing that her song will continue, “flung up to heaven” – and we celebrate the dawn that Maya Angelou helped bring. Laura and I are saddened to learn of the death of Maya Angelou. She was among the most talented writers of our time. Her words inspired peace and equality and enriched the culture of our country. We are grateful for the work she leaves behind, and we wish her the peace she always sought. Maya Angelou has been a towering figure — at Wake Forest and in American culture. She had a profound influence in civil rights and racial reconciliation. We will miss profoundly her lyrical voice and always keen insights. I was deeply saddened to learn of the passing of Maya Angelou, a true national treasure whom I have admired greatly for many, many years. Dr. Angelou was much more than a literary genius, a chronicler of Jim Crow, and a witness to history. Through her extraordinary work, she captured the tenacity of the human spirit and spoke of harsh realities in the most evocative, moving, and lyrical of ways. Over the course of a career spanning some of the most tumultuous decades of the last century, she taught us how to rise above ‘a past that’s rooted in pain.’ She gave voice to a people too often shut out of America’s public discourse. She displayed remarkable courage in the face of tremendous adversity. And she inspired generations to overcome life’s greatest challenges – through her extensive writings, her performances, her advocacy, her educational work, and her principled activism. For my family and me, Maya Angelou will always be much more than a great American and an icon in world literature. She is the namesake of one of my daughters, who met her as a young girl and celebrated her twenty-first birthday just one day before the elder Maya was lost to us. Although our hearts are filled with grief at the news of her passing – a sorrow made all the more acute by the knowledge that we shall not see her like again – she will continue to be a source of strength and inspiration. She will endure in the singular body of work she leaves behind. And she will live on in the shining example that guides our steps forward and fuels the work that remains. We have lost a legend, a trailblazer in the truest sense, and one of the guiding lights of the 20th century. Yet despite our heartache and our pain, Maya Angelou will always be with us. Her voice will continue to console, to challenge, and to inspire us. We bid her farewell today. But we know that, even now, ‘into a daybreak that’s wondrously clear,’ still she rises. 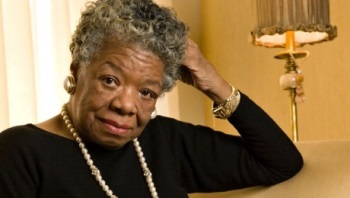 Sending a praise song to Maya Angelou, who has joined the ancestors. So much love for our people in every breath. She will be missed. EDITORIAL: Who’d Have Thunk It?